The BJP and its allies are now seeking votes in Lord Ram's name, inciting religious sentiments, creating a Hindu-Muslim divide, CPM leader Sitaram Yechury said on Sunday, adding that his party aims to defeat their divisive politics and set up a secular state. The Congress creates an atmosphere of fear for the judiciary when the court hears the Ayodhya issue. They do everything possible to impeach the Chief Justice. How can such things be accepted," Modi said in his rally in Rajasthan's Alwar on Sunday. Ram temple is not a political issue, Maharashtra chief minister Devendra Fadnavis on Sunday expressed hope that Shiv Sena chief Uddhav Thackeray, who is in Ayodhya, would get the blessings of Lord Ram. "The construction of Ram temple in Ayodhya is not a political issue. Shri Ram is the deity for entire India, Thackeray would get his blessings too," Fadnavis told reporters at Karad in Maharashtra's Satara district. More than 100 prominent Hindu seers, including Mahant Ravindra Puri, Mahant Suresh Das of the Digambar Akhada, head of the Ram Janmabhoom Trust Mahant Nritya Gopal Das, Jagatguru Ramanadcharya Hansdevacharya from Haridwar, Jagatguru Ramanandacharya Swami Ram Bhadracharya, Swami Gyananad Giri from Odisha were part of the religious congregation, IANS reported. 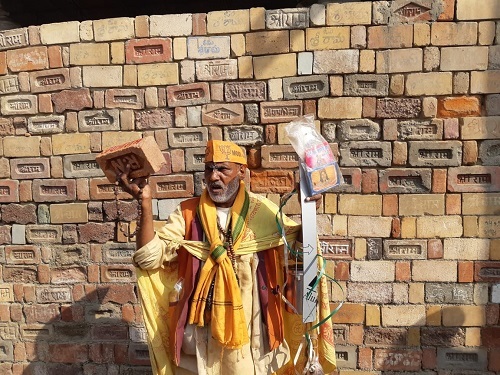 Mahant Soordas was stopped by the UP Police near the Chhavni when he tried going to the disputed site with a brick with 'Shree Ram' written on it. UP ADG (law and order ) Anand Kumar told reporters in Lucknow that there are one lakh people in Ayodhya. Out of which, 70,000 people are at the venue while the rest are on streets in the city. The Dharm Sabha on Sunday put the blame of delay in construction of the Ram temple on the Supreme Court instead of BJP. Dharma Sabha's stance ans shifting of blame indicates that next elections may be fought on the idea of Hindutva. RSS Chief Mohan Bhagwat will address VHP's 'Hunkar Rally' in Nagpur over the Ram Mandir issue later on Sunday, ANI reported. Founder of Pragatisheel Samajwadi Party (Lohia), Shivpal Yadav, met the Uttar Pradesh Governor Ram Naik over the Ram Mandir issue and asked him to suspend the UP government if it fails to maintain communal harmony in the state, News18 reported. 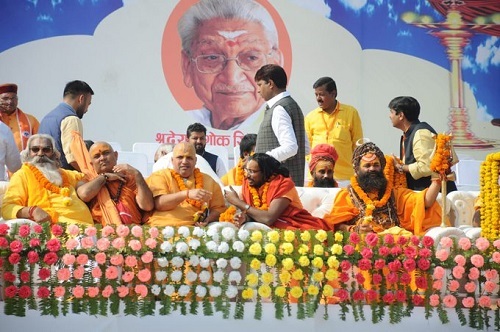 Vishwa Hindu Parishad (VHP)'s national vice-president Champat Rai addressed the gathering in Ayodhya for the 'Dharma Sabha'. The mobilisation you see today is just from 45 districts of Uttar Pradesh. Some intelligent people of this country need to be reminded that issue of Ram temple didn't end on 6 December 1992," Rai said, according to News18 report. A VHP banner saying 'Yachana nahi ab rann hoga' has become a centre of attraction at the 'Dharma Sabha' venue The organizers are reportedly miffed with the banner and are reprimanding the banner holders to remove the banner from the dais. Meanwhile, saints have done lamp-lightning for the event to begin. Uttar Pradesh deputy chief minister Keshav Prasad Maurya on Sunday disapproved of the Shiv Sena's push for constructing a Ram temple here, saying the party had no role in the temple movement. Maurya's remarks came a day after Shiv Sena chief Uddhav Thackeray asked the BJP-led NDA government to declare a date for the construction of the Ram temple. "There is no problem in Uddhav Thackeray catching a glimpse of Ram Lalla... 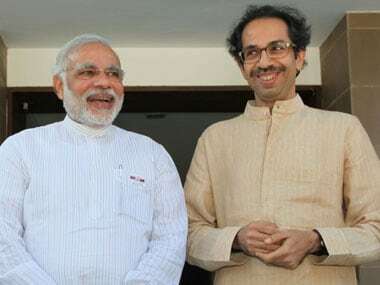 But, had Balasaheb Thackeray been alive, he would have prevented Uddhav from doing whatever he is doing,” Maurya told PTI.“The Shiv Sena had no role in the temple movement or even in the Dharam Sabha, though Balasaheb Thackeray would support the Vishwa Hindu Parishad,” he said. Sadhvi Prachi, the firebrand Hindu leader was not given place at the stage of the 'Dharma Sabha' and thus her supporters entered into an argument with the organisers. Meanwhile, saints have started to arrive at the venue as security drones keep a watch on the programme. Uddhav Thackeray in a press conference on Sunday asked the BJP govt at Centre to bring an ordinance on the Ram Mandir and said that Shiv Sena will support the govt on all Hindutva agendas. "Ab Hindu maat nahin khaaega, chup nahin rahega....Mandir yahin banega, zaroor banega lekin kab," Uddhav asked. He said that the government should stop playing with Hindu's emotions and not make the Ram temple issue into another of its 'chunavi jumla'. Dhruv Prasad Chaurasia, a resident of Azamgarh told the reporters on the ground that a lot of people have come to Ayodhya only to visit the city and do sightseeing and they do not know what the 'Dharma Sabha' is. The 'Chhavni', where the stones are kept for the temple construction was jam-packed and people are saying that they are waiting for the orders from 'Dharm Sabha' to start the construction. An equal number of women supporters have also turned up. However, the area was later evacuated by the VHP leaders. According to several media reports, Shiv Sena chief Uddhav Thackeray and his son Aditya Thackeray have left to pray at the disputed Ram janmabhoomi site in Ayodhya. This is Thackeray's Day 2 of the Mandir push. The Uttar Pradesh government will install a 221-metre bronze statue of Lord Ram in Ayodhya, Uttar Pradesh Principal Secretary (Information) Avanish Awasthi said on Saturday. While the height of the actual statue would be 151 metres, its overhead umbrella would be 20 metres while the pedestal would be 50 metres, he said. A museum would be housed at the pedestal, Awasthi said. 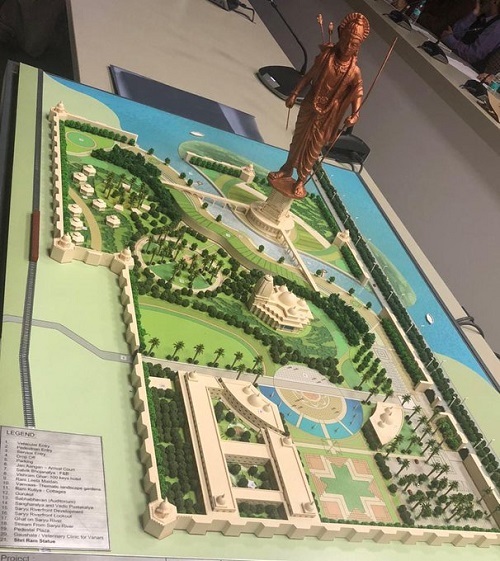 Five firms shortlisted for construction of the statue gave presentations before Uttar Pradesh Chief Minister Yogi Adityanath, the officer said, adding soil testing is being done for installing the statue. According to CNN-News18, the Vishva Hindu Parishad (VHP) rally is backed by the BJP government. Posters and banners of lawmakers have come up in and around the meeting area. However, the rally is expected to be largely peaceful. 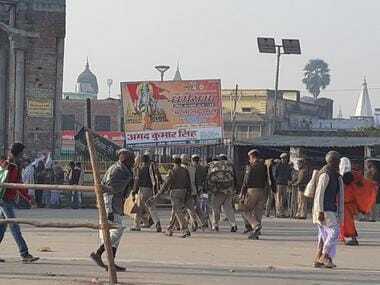 The UP Police has said that around five lakh people are expected while more than one lakh people have already arrived in Ayodhya from different parts of the country. The entire town has been turned into a fortress as there is police deployment and barricading is seen in abundance and no vehicle is allowed in the temple town. Samajwadi Party and former Uttar Pradesh chief minister Akhilesh Yadav said the Army should be deployed in Ayodhya, if needed, to maintain law and order. All India Muslim Personal Law Board (AIMPLB) Zafaryab Jilani said Muslims in Ayodhya are “terrified” ahead of the VHP meeting. No untoward incident was reported on Saturday and the police assured that strict security arrangements are in place. Meanwhile, Bahujan Samaj Party chief Mayawati has slammed the BJP and the Shiv Sena, saying they are raking up the Ram temple issue ahead of the Lok Sabha polls to divert attention from their failures. “Had their intentions been good they needn't have waited for five years. It's their political tactic, nothing else,” she said in a statement. Devotees bathed in Sarayu before going to the 'dharm sabha' venue. The Saryu river bank saw almost 50,000 people on Sunday, the local police said. People have been arriving in Ayodhya from acorss India over the last few days. After an initial show of strength by Shiv Sena on Sunday, more people arrived in Ayodhya on Sunday. "I am here to support construction of Ram Mandir. And I want the government to construct the temple as soon as possible. There should be no delay in constructing Ram Mandir," says Ritesh Kumar Chaurasiya from Chhapra, Bihar. Ritesh is one of the many VHP supporters who reached Ayodhya to take part in VHP-led Dharma Sabha. Sibal said that Modi is challenging the judiciary as the CJI had said in October that the Ram Mandir issue is not a priority. The conglomeration of Hindu seers on Sunday said that it was very much clear that the issue of Ram Temple was not dead yet. The Aam Aadmi Party (AAP) on Sunday tweeted a cartoon to mock the growing clamour over Ram Mandir in Ayodhya as the elections approach. Many activists and supporters demandedthat the construction of Ram temple should start from Sunday itself. "The state government, state police and the administration are committed to uphold the directions by the Supreme Court and High Court," ADG (law and order) Anand Kumar told ANI. Kharge called Shiv Sena's plea to the BJP govt for building the Ram temple as a mere rhetoric and termed the party's attempts as a political ploy. 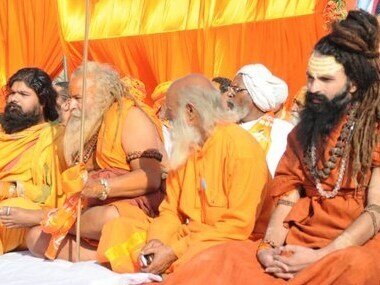 Udhhav asked the BJP to bring an ordinance On Ram Mandir and get the temple made as soon as possible. Yoga guru Ramdev asked on Twitter on Sunday that if land can be acquired for construction of roads, hospitals and airports, why can't it be done to build a temple. Reacting to Akhilesh Yadav's statement that 'Army should be brought in Ayodhya if required', MoS MEA VK Singh told ANI, "There is enough law and order machinery available. I'm quite sure the govt being that of the BJP, unlike other parties, will ensure that law and order is maintained." The Shiv Sena chief is on the second day of his Ayodhya visit today. He visited the Ram Mandir site earlier on Sunday to pray along with his son Aditya Thackeray. As both Shiv Sena and VHP supporters are out on the streets, security has been tightened by the Uttar Pradesh Police. VHP workers who have come to Ayodhya from across the country chanted slogans for the construction of Ram Mandir. They demand that the construction of the temple should start on Sunday itself. Arriving in Ayodhya ahead of Sunday's VHP rally for a Ram temple, Shiv Sena chief Uddhav Thackeray on Saturday asked the Narendra Modi government to wake up from a “Kumbhakarna-like slumber” and declare the date for its construction. “I have come here to awaken the Kumbhakarana,” he said Saturday, indirectly comparing Modi, or his government, to the Ramayana character known for sleeping for months at a stretch. “Today's Kumbhakarna has been sleeping for the past four years," he said. 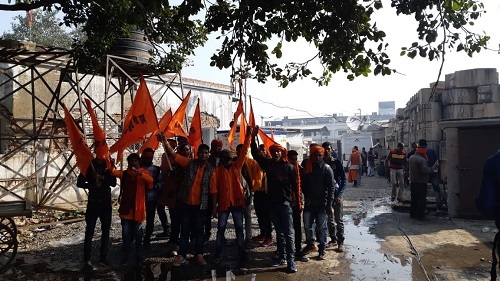 The town turned into a virtual fortress with multiple layers of security and deployment of drones as people began arriving here for Sunday's `Dharam Sabha', being organised by the Vishwa Hindu Parishad to push for the construction of the Ram temple. The Sena leader is also urging the government to bring legislation – or an ordinance – for building the temple on the disputed site in Ayodhya, but he has not linked his own two-day visit to VHP event. The VHP claimed three lakh people, including seers, will attend its public meeting, which has triggered some apprehension over the safety of the town's Muslim community. Ayodhya turned into a fortess on Sunday as more people arrived in the city to take part in VHP-led Dharma Sabha. People were chanting slogans of making the temple on the same day itself. Ayodhya news LATEST updates: Maharashtra: The Congress creates an atmosphere of fear for the judiciary when the court hears the Ayodhya issue. They do everything possible to impeach the Chief Justice. How can such things be accepted," Modi said in his rally in Rajasthan's Alwar on Sunday. RSS Chief Mohan Bhagwat will address VHP's 'hunkar rally'* in Nagpur over the matter of Ram Temple later today. Meanwhile, the Dharm Sabha in Ayodhya put the blame of delay in construction of the Ram temple on the Supreme Court instead of BJP. Dharma Sabha's stance ans shifting of blame indicates that next elections may be fought on the idea of Hindutva. Devotees bathed in Sarayu before going to the 'dharma sabha' venue. 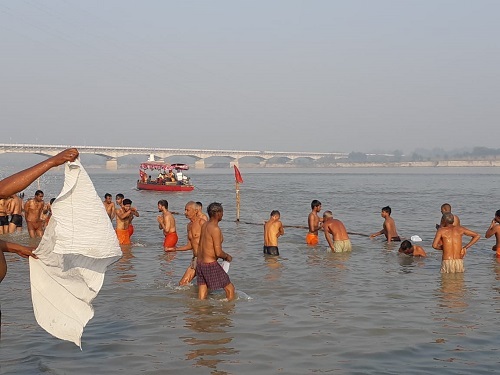 The Saryu river bank saw almost 50,000 people on Sunday, the local police said. Ayodhya turned into a virtual fortress with multiple layers of security and deployment of drones as people began arriving for Sunday's 'Dharam Sabha', being organised by the Vishwa Hindu Parishad to push for the construction of the Ram temple. Arriving in Ayodhya ahead of Sunday's VHP rally for a Ram temple, Shiv Sena chief Uddhav Thackeray asked the Narendra Modi government to wake up from a “Kumbhakarna-like slumber” and declare the date for its construction. “I have come here to awaken the Kumbhakarana,” he said on Saturday, indirectly comparing Modi, or his government, to the Ramayana character known for sleeping for months at a stretch. “Today's Kumbhakarna has been sleeping for the past four years," he said. The Sena leader is also urging the government to bring legislation – or an ordinance – for building the temple on the disputed site in Ayodhya, but he has not linked his own two-day visit to VHP event. The VHP claimed three lakh people, including seers, will attend its public meeting, which has triggered some apprehension over the safety of the town's Muslim community. Samajwadi Party and former Uttar Pradesh chief minister Akhilesh Yadav said the Army should be deployed in Ayodhya, if needed, to maintain law and order. All India Muslim Personal Law Board (AIMPLB) Zafaryab Jilani said Muslims in Ayodhya are “terrified” ahead of the VHP meeting. No untoward incident was reported Saturday and the police assured that strict security arrangements are in place. Thackeray said his party will support any legislation or ordinance for the Ram Mandir, which Hindutva organisations want to be constructed at the site where the Babri Masjid was demolished in 1992. “Day, months, years and generations have passed,” the Sena leader said on what he described as his first visit to the town to seek ‘darshan' of Ram Lalla. “Mandir wahin baneyange, par date nahin batayenge (You say you will make the temple there, but won't tell the date),” he said. 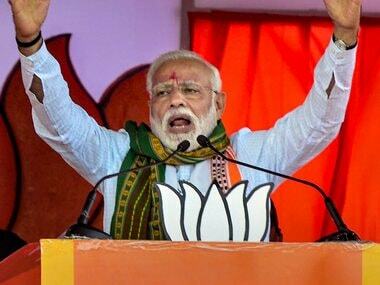 “First say when you will construct the temple, the rest we will talk later,” he said in what sounded like a dare to the Bharatiya Janata Party-led government. He said bringing a law on the temple's construction may have been difficult during Atal Bihari Vajpayee's term as it was a coalition government then. But the current government is strong, and the BJP is in power both at the Centre and in the state. “Bring an ordinance or law, the Shiv Sena will support it,” he said. The Sena chief said he did not want to take the credit for the temple's construction, and others were free to do so. 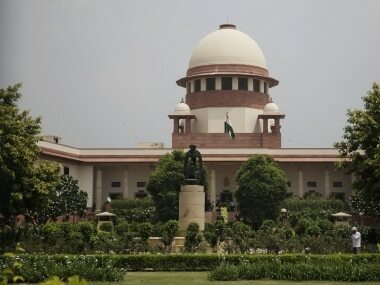 "But how many years should we wait for the temple?” "Ram temple is a matter concerning faith and the government needs to bring a law before the court verdict,” he said, referring to the Ram Janmabhoomi-Babri Masjid land case before the Supreme Court. The apex court has said it will set the dates for the future course of hearings only in January. Thackeray recalled former prime minister Vajpayee as saying, 'Ab Hindu maat nahi khayega (Hindus will not be defeated now), and added, "Hindus will not sit silently." 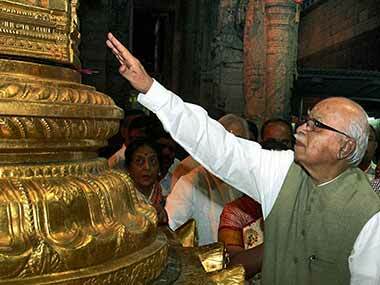 "There is no political motive behind my visit to Ayodhya,” he claimed. The Sena chief was greeted with slogans of "Jai Shri Ram" when he arrived in Ayodhya with his wife Rashmi and son Aditya. Mahant Nrityagopal Das, the chairman of the Ram Janmabhoomi Nyas, was among those who welcomed Thackeray at Lakshman Qila, where the Sena leader made the remarks. A drone monitored the event. Thackeray went to the banks of the Saryu river in the evening to offer prayers. The Sena claimed to have brought several thousand supporters to Ayodhya for Thackeray's events. Bahujan Samaj Party chief Mayawati has slammed the BJP and the Shiv Sena, saying they are raking up the Ram temple issue ahead of the Lok Sabha polls to divert attention from their failures. “Had their intentions been good they needn't have waited for five years. It's their political tactic, nothing else,” she said in a statement.